Yes, the title of this post is a bit linkbait-ish, though it’s not meant to be. I’ve recently decided to make Nikon my primary camera system (instead of Canon) and wanted to write a little bit about the reasons why, plus share a few potentially helpful hints for anyone who might be considering doing the same, especially for underwater photographers using a Nauticam housing. I couldn’t think of a more straightforward post title, so there you have it. Let me preface by saying that this isn’t a technical review. Doing meticulous tests and measuring things isn’t my thing. There are plenty of more analytical types who can opine on dynamic range, noise, and the like much better than I can, so please Google if you’re looking for information of that nature. This is a “here is my personal experience and opinion, take it or leave it” post. Also, I don’t use my cameras for video, so there is no consideration of video-related things in this post. I don’t often write about gear, except in the general sense (see Thoughts on Evolution of Photography), but I think it’s worth making an exception in this instance for a couple of reasons. First, I am as close to brand-agnostic as photographers get. I started with a beat-up Nikon F2A in 1989 and shot entirely with Nikon film cameras (F90, F90x, F100) until I switched half to Canon in 2001 (Eos–3, Eos–1v), and completely by 2005 (1D MkII). I stuck entirely with Canon until 2012 when I picked up a Nikon D800 for a specific project, then a Sony a7r in 2015 and the a7rII afterward. I’ve also used an Olympus OM-D EM–5, though only above water. The only thing keeping me from trying equipment from other manufacturers are practical considerations—money, time, and keeping everything straight in my head. Second, the D850 is a whole new proposition as far as DSLRs go. It is full-frame, has 45.7 MP resolution, and shoots at up to 7fps…meaning high-resolution + fast fps! Prior to this, you got one or the other, high-resolution or high-speed, not both. From playing with the D850 for a couple of weeks now, I can tell you that the files are great as well. In short, the D850 is a beast of a camera. Right, so that’s the background. Here is what I decided and why. Since 2012, I have primarily been shooting with a Canon 5D Mark III underwater, sometimes using a Nikon D800. Both models are full-frame cameras that produce excellent results, with different pros and cons. Without getting sidetracked about the reasons why, my primary usage cases were big animals in the blue for Canon, and macro subjects for Nikon. Here we are, approaching the end of 2017 though, five+ years later. Both cameras have become a bit dated, and like many other photographers, I was keeping an eye out for a major improvement from both manufacturers, particularly given the impressive leaps in capability that mirrorless options like Sony’s top-of-the-line cameras have made. But here was my quandry. When Canon released the 5D Mark IV in 2016, I looked at the specs, read the reviews…and yawned. Great camera, no doubt. But not worth the trouble for me to upgrade (keep in mind that upgrading for an underwater photographer entails at the very least getting a new housing, sometimes more stuff too, so it’s a bigger decision than for a non-submerged photographer). Then came the 6D Mark II. Total sleeper. 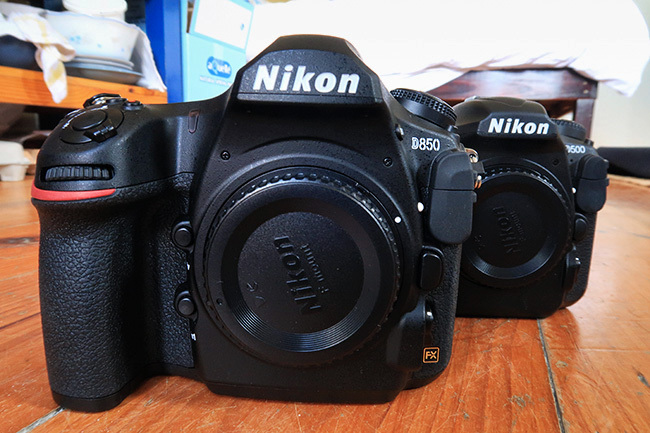 In the Nikon universe, the D810 just wasn’t enough reason for me to change cameras at the time it was released. So when the I got home from extended travel in late September and read-up on the D850, I was sold. This was the upgrade I was looking for. 7fps is plenty fast for most things. The buffer (stated as 51 images for 14-bit lossless compressed RAW) is more than sufficient. The AF is fast and accurate. The XQD card reads/ writes super-fast. The only minor thing I wasn’t happy about was the lack of a built-in flash (my D800 has one), which I know a lot of people frown upon, but I’ve found built-in flashes to be convenient and useful. I can (very) grudgingly live without. So, having effectively decided to pass on the Canon 5D Mark IV in favour of the Nikon D850, I am for the first time in a while looking forward to consolidating gear. Going forward, my plan is to use the D850 as my primary camera for underwater, and a Nikon D500 for breaching and other things I had relied on the Canon 7D Mark II for, as well as for underwater photos. I have a Nauticam housing for the D850, and a custom-made Zillion housing for the D500. I’ll keep my D800 as a back-up. I know both the camera and the Nauticam housing I use with it inside and out. Lenses were of course a big consideration in making this decision. Underwater, I primarily use fisheye and macro lenses. I already have the Sigma 15mm fisheye lens for Nikon and both the 60mm and 105mm Nikon macro lenses, so I was set in that department. To switch from the Canon 7D Mark II to the D500, I had to get a new Nikon 70–200mm lens, which didn’t represent too big of an incremental cost once I factored in the resale value of the two Canon 70–200mm lenses I had. I decided to plunk down for the E version instead of the G, given the rave reviews I read about the E lens. I’ve used it a few times now. Verdict: Definitely a kick-a** lens that shines with both the D500 and the D850. I’ll eventually need to make a decision whether to get the Nikon version of the 10–17mm Tokina fisheye lens or the new Nikon 8–15mm fisheye lens to use with my D500. I have a project in mind for next year when I might need one of those lens combinations, so I can still mull it over for a while. The only situations I don’t have covered with my Nikon equipment are landscapes and focal lengths beyond 200mm. That’s why I’m hanging on to my Sony a7rII, for landscape and similar situations when AF isn’t an issue, and a Canon 7D Mark II for now, to go with my longer Canon lenses. If you’re up on the latest camera releases, you might be wondering how the Sony a9 and a7rIII fit into my thinking. I had a chance to handle the a9 recently with the Sony 100–400mm G Master lens. It was impressive, as I’m sure the a7rIII will be. I’d love to carry lighter mirrorless cameras, but I can’t fully commit to Sony for the time being. There aren’t enough lenses in the line-up yet. Sony has no native fisheye option, for instance. Using a converter is an option, but not ideal. And Sony is deficient for long lenses, at least for now. I’m sure that will change in the next few years. I’m also not a fan of the menu system (the least user-friendly among the manufacturers), the lack of lossless compressed RAW, and the use of SD cards instead of XQD, a format that Sony helped develop. I’m hopeful though that Sony keeps advancing by leaps and bounds as it’s been doing in recent years, and addresses these shortcomings. So that’s the lay of the land as far as my gear strategy goes for the foreseeable future. To sum it up…Canon (mostly) out. Nikon in. Sony for some stuff, with hopes the company keeps improving. For many years, Canon was the clear leader in many respects, but that’s so not the case now, at least not for the things I plan to do. I’m not sure how Canon lost its way. I just have to accept that the situation is what it is. On to more practical things. It always takes a bit of work and time to get comfortable with a new camera, to gain fluency, so to speak, with the handling of hardware and quirks of software, as well as the layout and functionality of a new underwater housing. Sometimes the changes are small, sometimes substantial. In this case, the learning/ mistake curve has been relatively steep. Since I mostly used Canon for over decade, my brain is geared toward Canon’s architecture and design philosophy. As a result, I’ve had to invest some time deciphering manuals and experimenting with settings. Painful. One note…at this point, I haven’t spent much time underwater with the D850, so my experience with the entire system while submerged is limited. It’s not for lack of trying. I’m working on a project now, but the conditions have been such that I haven’t spent any real time in the water yet. Keeping fingers crossed that the situation changes soon, but most of the variables are out of my control. Nature does what she wants to do. So here are a few practical tips derived from futzing with my new camera and housing that might be useful to you, especially if you’re a Nikon user who plans to shoot underwater with a Nauticam D850 housing. If you read through this and think there’s a better way to do something I’ve written about or have a useful tip pertaining to something I’ve missed during my hours of cross-eyed examination of the D850 user manual, do please clue me in! In Playback Menu, the first menu section, go to Playback display options. I select Focus Point, None (image only), and RGB histogram. This is just what I like to see. Having all the options selected results in too much clutter when reviewing images. In the Photo Shooting Menu, go to NEF (RAW) recording. I set this to NEF (RAW) compression to ON with lossless compression, and NEF (RAW) bit depth to 14-bit. From what I understand, lossless compression is really lossless. It reduces file size viz. uncompressed, which means quicker file read time and less storage space. I only shoot in RAW, so I don’t bother with any of the jpg options. The Customs Settings Menu presents you with a lot of options for customising how your camera works. It can be a bit overwhelming, especially when the explanations often don’t make a lot of sense. Following are some of the settings I use. a2: AF-S priority selection: I keep this on Focus. AF-S is something I pick when subjects aren’t moving much and I want to be certain to hit focus. b4: Easy exposure compensation: I set this to On (Auto reset). This gives me the ability to adjust exposure compensation with Aperture and Shutter priority modes without having to hit the exposure compensation button (one less button to worry about on the housing). I can just use the control dials. This means it’s a lot quicker to fine tune exposure, which I like (it’s the way I became accustomed to shooting with the Canon system), but it also introduces the risk of your accidentally moving dials around and screwing up your exposure by accident if you’re not careful. Set this at your own risk. The (Auto reset) option clears the exposure compensation when you switch off the camera, so you don’t accidentally leave exposure comp dialed-in. f1: Custom control assignment: This gives you the ability to assign a range of functions to specific buttons. The main one I use is the Fn2 button, which I’ve set to My Menu, which is the last/ bottom icon on the main menu. The My Menu item allows you to pick items from entire/ long menu list and keep the ones you access often in one place, so you can find them easily, without frantically searching through all the items. For instance, I keep Format memory card, Time zone and date, and a8: AF activation in My Menu. Format memory card allows me to format easily in the water if I want (like if I’ve forgotten to format after downloading previous files). Having Time zone and date in My Menu reminds me to set the proper time zone and date each time I travel, important for keeping accurate records of when and where I took a given image. And a8: AF activation gives me quick access to that back button focus option I mentioned above. The reason I like to use the Fn2 button is because of my housing. The Fn2 button is dead obvious and easily reachable on the upper left of the Nauticam D850 housing, just above the review lever. 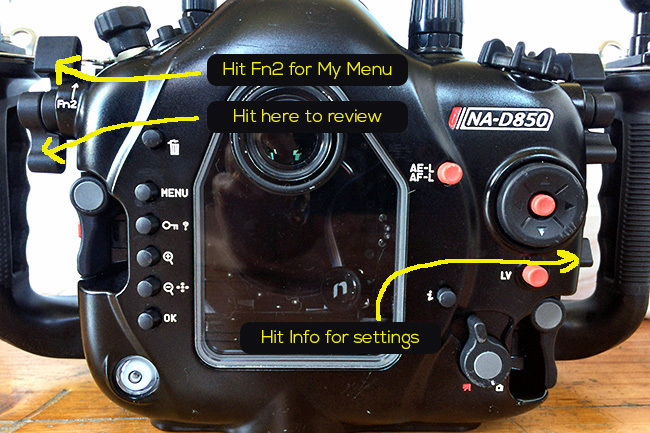 By assigning My Menu to Fn2, I have three main levers I use to work the camera underwater: The Info lever on the right side of the housing when I want to check/ change my settings; the Fn2 lever on the top left of the housing when I want quick access to My Menu; the Review lever just below to Fn2 lever when I want to review photos. All accessible with my thumbs. I like to keep things as simple as possible to minimise task-loading on my brain. This is about as simple as it gets. Those three levers give me quick, thought-not-required access to most of things I need to do. You can of course use f1: Custom control assignment to assign controls to many other buttons, so find what works for you and take advantage of these shortcuts. If, for example, I anticipate that I am going to need to adjust a particular setting often during a given project/ dive, I may assign it to both Fn1 and Pv. Those buttons are accessible at the front of my housing, depressed with my right pinky or ring finger. This may just be me, but I don’t have the fine motor control and accuracy with those fingers necessary to select either Fn1 or Pv correctly each time (especially when in cold water with general numbness in extremities and thick gloves on), so I will assign the same function to both. That would mean that I can just slam away with the lower part of my right hand and be pretty sure I’ll hit one or the other button to call up the function I want. When I’m done with that particular situation, I’ll reset Fn1 and Pv to have no function, so I don’t call up a menu item that I don’t need by accident. The concept is idiot-proofing my set-up to protect myself from my own incompetence. I have years of experience doing this. f6: Release button to use dial. I set this to Yes. What this does is give you the ability to hit a function button once, and change the settings without having to hold that button down while you do it. For example, if you want to change the Exposure Mode and you hit the Mode button, normally you’d have to hold that Mode button down while turning the relevant dial. By setting f6 to Yes, you can hit the Mode button and let go, then turn the control dial as appropriate. Touch the shutter again to exit the adjustment and set whatever you chose. This isn’t as critical on land, but underwater, being able to do this means having maximum freedom of hands. Here’s what you do: Hit the Info lever on the housing to call up the information screen on the back LCD, then hit whatever button you need, and you’ll see that you can adjust the relevant setting without holding the button down. Magic! Finally, a note for anyone using the Nauticam TTL converter. It’s been a long time since I’ve used TTL, but I decided to give it a try, with the operating assumption that I can choose to use the TTL functionality when convenient, and switch to manual exposure when that’s more appropriate. I haven’t put in enough time with the converter to form an opinion. So far, I am having inconsistent results. Sometimes the converter seems to nail the exposure; at other times it misses by a long shot. But that could just be lack of experience on my part in working out exactly how to use it. I have not had the chance to test the TTL converter in controlled conditions underwater, which is something I’ll do at first opportunity. For what it’s worth, I have been using Inon Z–240 strobes, the latest generation, and I’ve set both TTL converter switches inside the housing to the off position, both magnets on the Z–240 to up position, and set the D850’s flash sync speed to 1/250s (not Auto FP). Use e1: Flash sync speed to set this. I set the Inon strobes to S-TTL, and use the power level knobs to adjust flash exposure for each individual strobe. You can also use the minus button (the one you use to reduce the magnification when you are reviewing photos you took) on your camera for global flash exposure compensation that affects all attached strobes at the same time. Switching the strobes to manual mode allows you to shoot them as manual strobes. A final reality calibration before ending this post. Earlier I wrote about David duChemin’s book The Soul of the Camera. The overarching message of the book is one that I agree with…that most of the time, gear is not the most important part of photography. The user of the gear is. The reason I don’t write much about gear and settings is my belief that most people devote disproportionate time to thinking about gear and settings, and far too little time to refining personal style and imbuing their images with meaning/ soul. The ratio of times people have asked me, “What camera do you use?” or “What were your settings?” to “How did you learn about the animal/ conditions and prepare for the project?” is something approaching infinity. Shame, really. In chatting with a friend a few days ago, I said that the creation of unique, memorable images comprises 10% gear, 90% knowledge, experience, vision, feeling, instinct, emotion, personality. For underwater natural history photos like those that I pursue, add hours and hours of reading, studying, note-taking and contemplation, plus never-ending physical training, eating well and getting sufficient sleep. Of course, I recognise that the 10% that is gear is a critical 10%. Without it, there would be no photographs. But think of it this way: A lot of people own expensive, fancy cameras. Relatively few people create lasting images. What I’m saying is this: Read what I wrote above in proper context. My decision to switch from mainly Canon to mainly Nikon has nothing to do with believing that changing cameras or switching manufacturers will somehow bestow magical success upon me. And I am by no means suggesting you need to switch or even agree with my switch or my opinions. I am simply refining my selection of tools for the projects I see myself pursuing over the next few years, trying to match the tools to the tasks as best possible, and making optimal use of the latest technology whenever I can. My bet is that Nikon gear is going to be the best fit for me for the time being as I pursue my creative efforts. Whether I succeed or not though, depends on my own vision, creativity, and determination. And if I’m wrong, I’ll switch again.